I was unable to order online or I want to purchase an item that isn't available to be ordered online yet. Do you have an order form online that I could download and fax or e-mail back to you? Yes. Click on the Order Form link below. That will open up a PDF Order Form you can fill out and submit online or print and fax back to us. Fill in the fields by clicking on the 'select text' tool in your acrobat reader and typing in the fields. NOTE: We will no longer accept hand written order forms. What kind of artwork can I send? And, what if I don't have artwork? VECTOR: This is the preferred file type. Vector-based artwork is resolution independent and can be enlarged or reduced without loss of quality. See the table below for authoring software capable of creating this type of file. BITMAP: This type of file is resolution dependent, and will reproduce poorly if the appropriate file resolution is not supplied (300dpi or greater). If you supply bitmap art, it is best to save your artwork in a 1 to 1 (full size) output ratio at 600 dpi. Lower than 300 dpi resolutions will result in reduced image quality. AVOIDING ADDITIONAL COSTS: Files obtained from the internet (.jpg or .gif) or artwork created in MS Office applications (Word, Excel, PowerPoint, etc.) are often not suitable for high quality output, and often require additional hourly charges. To avoid additional costs associated with these types of files, please supply the files in accordance with the defined herein. Additional artwork charges will be billed hourly at $50 an hour. Note: If your artwork does not meet our production specifications, we will attempt to "clean up" your artwork to produce the highest quality product we can. If your artwork requires "clean up," your set up fee is NON-REFUNDABLE. PAGE/ARTWORK DIMENSIONS: Documents should be created at 100% the actual finished size. If your software application has restrictions on page sizes, create your document in a reduced scale (10% reduction increments). Please indicate the scale used on all files which are scaled. Bleeds are not necessary. Failure to supply documents at exact, final sizes will result in additional charges. COLOR SPECIFICATIONS AND PROOFS: Supplied bitmap files should be in the RGB color space. All colors in Vector and Page Layout applications should be specified using the Pantone Matching System (PMS®). Recognition Express will not be responsible for color variations or matching colors on final output if these requirements are not met. Always send 100% accurate proofs (color laser prints) with your disk. TYPE FACES/FONTS: Convert all fonts to outlines before saving your file for transfer. If you do not convert your fonts to outlines, font substitution will occur, resulting in unexpected output. Remember that once fonts are converted to outlines they are no longer editable. If you don't have artwork don’t worry. Send us what you have. Our professional art team will work with what you have to create exactly what you need for an additional artwork charge of $50 an hour. If you do not have a logo that is capable of transfer and we have to recreate it there will also be an artwork charge of $50 an hour. In most cases we can work with what our customers give us without issue. Yes! We keep your artwork on file to make reordering and using your art on other products simple and easy! Once your product is approved it is added to our catalog and you will get a direct link to order your product in the future. Simply reply and attach it to your order confirmation e-mail and we’ll take it from there. You can also send it to setups@recognitionexpress.com or e-mail directly to your Customer Care Representative. Yes! Keep in mind however, that in some cases there is an additional charge for this service in order to get the specialized ink if an exact match is required. There are also a few products where, due to the limitations of the imprinting process, exact PMS matching isn't possible. One of our Customer Care Representatives can quickly help you with this. If you don’t require an exact match, but would like us to be ‘as close as possible’ – we’re happy to help. Just let us know which colors we should be working towards in the ‘additional comments’ section in the order process, or just let a representative know. I would like to have a copy of your catalog available in the office. Do you have one available? Yes. CLICK on the appropriate logo below to begin your download. 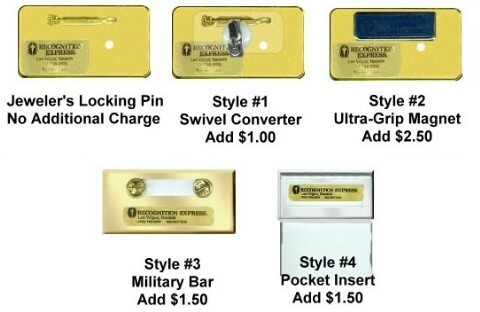 Some of the items we offer have ‘set-up’ charges (screen charges, die charges, etc.). It is important to note these are NOT art charges. These are charges to create the screen, die or other necessary items to imprint your specific logo. Keep in mind that if you ever place an exact reorder for the same item you do not have to pay the set up charge again! No! If you place an exact reorder (same art and item) you aren’t charged a set-up charge again. Also, once we’ve done your logo in a digitized format for embroidery, we don’t charge you a new tape or digitizing charge to embroider any other item! Recognition Express will provide one (1) proof per name badge style/size or product that contains artwork (i.e. your company logo). (For example: If you order one name badge style/size for 3 people, you will only receive one (1) proof in order to approve the layout for that style/size.) The approved layout will be used for all names that correspond to that particular product style/size. We collect all applicable taxes for goods and services shipped into Wisconsin. Customers in other states may be required to remit use taxes. If your organization is exempt, please supply your Customer Care Representative with your resale certificate. Yes! We’re happy to send you a sample of an item(s) you’re considering. We send the samples free of charge and in most cases they are yours to keep. Occasionally (for expensive items) we may ask you to return the item so we can keep our prices to you low. Our sample service is intended to help those who are seriously considering an item or are looking for ideas. We reserve the right to refuse to send samples at our discretion (although we don’t usually find the need to!). Most of the time the minimum quantity shown is the required minimum, although we encourage you to call if your requirements mean you need fewer items so we can offer assistance if possible. If you need to order more than the quantities shown please call 800-457-7030 as additional discounts are available. On some of our products you can use a slider to order ‘in-between’ quantities – so you can order exactly how many you need. How does your 90 day 100% Guarantee on manufactured items work? What if I'm unhappy with my order? Within 90 days if you’re unhappy with your order because the product is defective or ‘not as promised’ or the imprint quality isn’t ‘spot on’ just contact your Customer Care Representative and we’ll rerun your order at no cost. We’ll even pay the shipping to get the problem product returned. We want to develop a long term relationship with you and will work with you to be sure you’re 100% satisfied. - The artwork, designs and trademarks shown on products on this site are examples of the products and imprinting services we offer. - All prices and product information are subject to charge without notice. Whan happens when I place an order? Once you place your order, you’ll immediately receive an e-mail confirmation with your order ID number. If you are ordering an item in our catalog that does not require original artwork you are finished and can just wait to receive your products. If you have artwork you’d like us to use or work from to create new art, simply send your artwork to setups@recognitionexpress.com along with any additional production requests that you might have. Shortly thereafter (during business hours) you’ll receive an email from the Customer Care representative who will be taking personal care of your order. This promotional products expert will fully review your order, confirm dates and review your artwork. Once all of the details are set, the next thing you’ll receive is an email containing an ‘e-proof’ showing your artwork on a mockup of the item(s) you’re purchasing. There you’ll have the opportunity to approve it, or make suggestions for changes and improvements. Remember, nothing goes into production without your approval! We accept checks and all major credit cards. You can also request open account. If you choose this option, we will automatically check with D&B to see if an account can be open. If you’re not listed with D&B or the listing is incomplete we will send a credit application. Please allow extra time for this credit checking process. Your order can’t go into production until your account has been opened. Our terms are net 30 days. We also offer open account for most government and educational institutions. When is my credit card charged for a transaction? We ‘authorize’ your card once your order is ready to go into production, but we do not collect the funds until your order ships. I typed in my CATALOG or MANAGER password and it says Unauthorized Attempt. Your passwords are case sensitive. Make sure you typed in the password exactly as given. Make sure your CAPS lock is off. I typed in my order and clicked SUBMIT, but then I realized I made a mistake on the spelling of a name. Locate your order ID. It will be the date and then a series of letters and numbers similar to this: 06172005-W456EX. If you can call us immediately, usually the same day, we may be able to catch it before it goes into production. The advantage of your private website is that your order goes right into our production system so if you make a mistake you must inform us immediately. I typed in a name, but I realized I made a mistake on the spelling. I have not clicked on the SUBMIT button so my order is not complete. What do I do? You have a VIEW CART tab at the top of the page. Click on it and you will be able to view all the items in your cart. You can delete any items you wish. Close the window and start over. I am typing in the information, but when I got to my fifth name (or at any time during the order) or when I tried to click SUBMIT, it keeps dumping my information and then I get a message that says: SYSTEM DOWN FOR DATA BASE MAINTENANCE. Did my order go through? Usually this happens if you are trying to order between 7:00 pm PST to 7:30 pm PST. Our IT department runs system checks at that time. Occasionally, we have to shut the system down during the normal working day for emergency backups or other reasons. These system checks only last a few minutes. If you are still on the ordering page, then you should be able to click REFRESH once the system has come back up and it should allow you to continue. If you closed yourr browser or have left the website, then you will have to go back to the catalog and restart your order. I would like to see what you fasteners look like. Do you have any place available for me to view them? I want to purchase an item that isn't available to be ordered online yet. Do you have an order form online that I could download or e-mail back to you? Yes. Click on the appropriate "Order Form" link below. That will open up a PDF Order Form you can fill out and submit online or print and fax back to us.